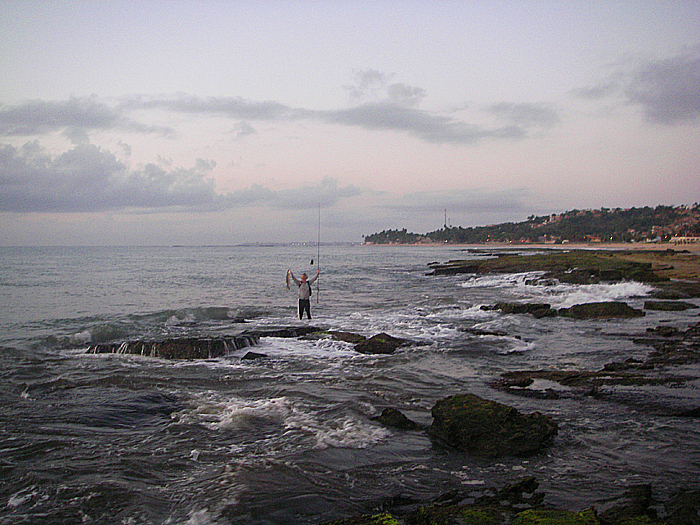 Richard has been living in Brazil for over six years now and of course with the demands of learning Portuguese, working and raisng a young family, learning about the local fishing has been a slow process. 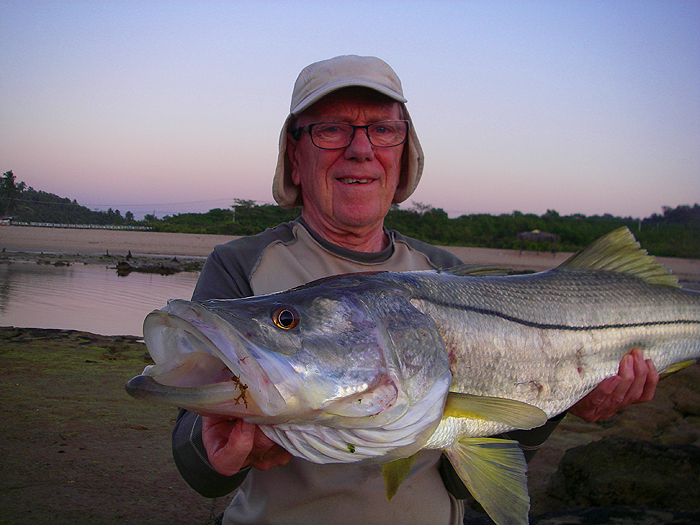 In fact he is pretty experienced at using bait to catch snapper and several species of catfish but consistency with the larger fish such as jacks and snook has so far eluded him. 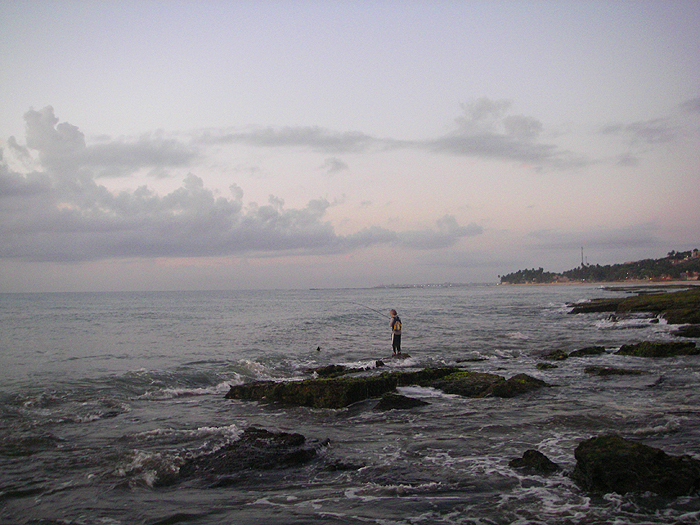 On the bright side just before our recent visit (we arrived on the second of January) he'd tried to suss out the possibility of catching snook from the shore and on the previous set of tides had been broken by a very large fish which took a lot of line before ploughing into the rocks. 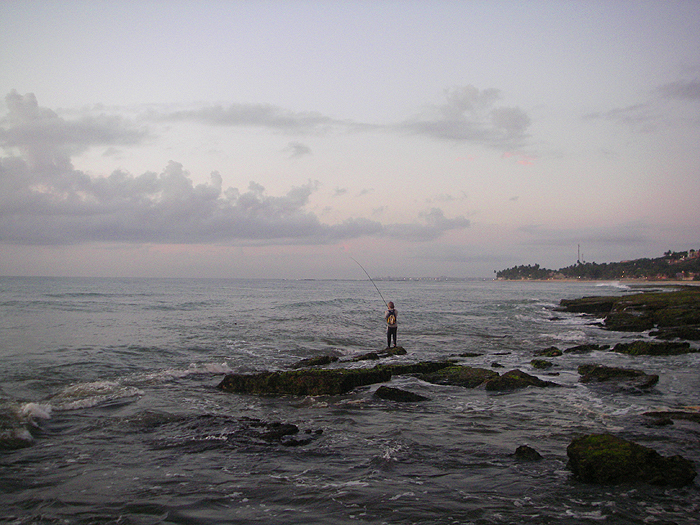 Anyway, we were encouraged when, on the first morning of my stay, we parked the car, picked up the rods, paddled out before dawn onto the rocky reef at Mermaid Beach and began to cast into the pounding surf. Both of us were fishing with our 'bass' spinning gear. Fixed spool reels loaded with whiplash braid (mine 30lb BS and Richards 50lb following his recent loss), Four piece Sure Popper rods, short traces (Richards 40lb Amnesia and mine 20lb knottable wire) and weedless lures, which are essential in the 'weed soup' commonly encountered. Richard favoured one of the Fiiish Black Minnows which I'd taken for him while I was using a big, unweighted white Slug-Go. For ten minutes it was cast and retrieve then Rich had a pluck which he hooked. 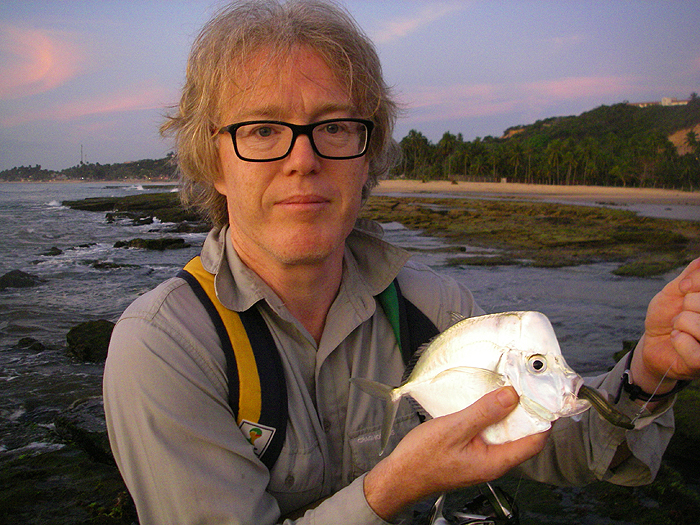 Clearly it wasn't a big fish so it wasn't long before he was holding a beautiful, silver plated, lookdown that had somehow managed to engulf the lure. We persisted for another half hour but apart from a couple more plucks from small fish we landed no more before packing in. 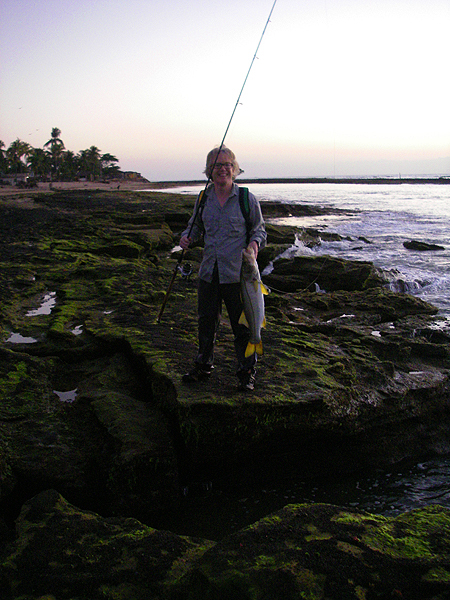 On my somewhat lighter gear I was a bit concerned that the fish might head along the reef and my confidence wasn't boosted when Richard pointed out (a few times) that this was a VERY big fish. 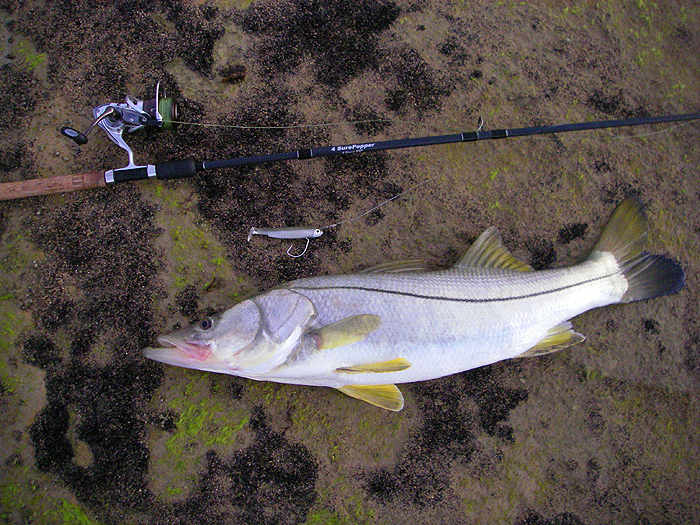 I kept the rod up and did my best to steer the snook into the open water immediately ahead of where we stood. The line picked up a bit of loose weed and once or twice heavy side strain was required to keep the fish within the area where I wanted it to stay. However, eventually it began to tire and after about fifteen minutes I was able to guide it through a gap and into a narrow channel where it lay until my son could nip down and pick it up. What a cracker. All of twenty eight pounds, the biggest one I have ever caught. Two big snook on our second morning. Couldn't be better! Of course after that start it had to be a bit of an anti-climax. Nevertheless we had snook bites on every series of tides and landed several more good fish (the smallest was seven or eight pounds) all on weedless soft plastics. Some of the more exciting moments were when large fish smashed into lures on the surface but failed to hook themselves properly and came unstuck. 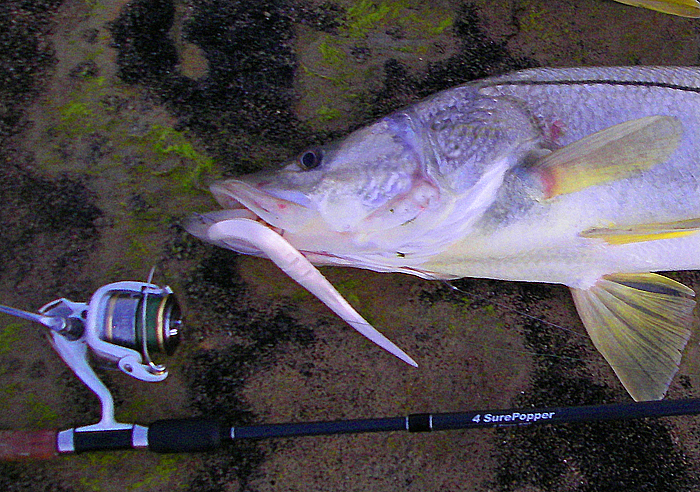 In a total of eleven, one hour, early morning sessions we had no less than nine takes and landed five snook. Some time this year I fully expect to hear from my son that he has landed a the mother and father of all snook - keep up the good work! 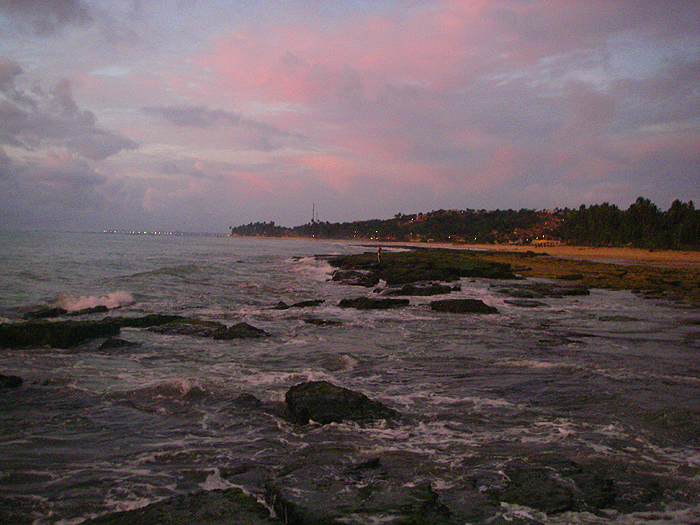 All in all it was a fantastic holiday and I can't wait to visit the Brazilian branch of my family again. 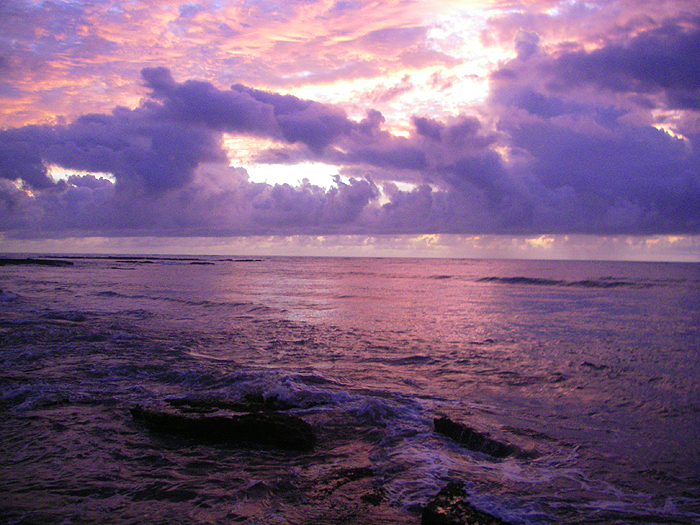 Mermaid Beach. It's only fishable around low water. Lookdown. 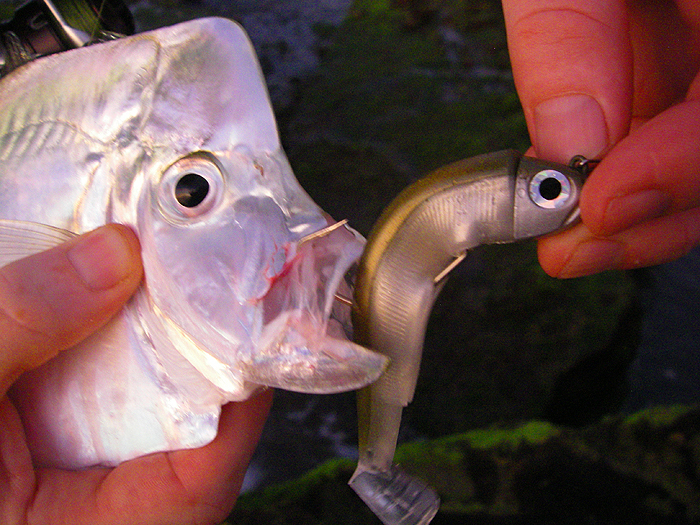 We've also caught leatherjackets, jacks and barracuda, generally on smaller lures. How did it manage to absorb this lure? 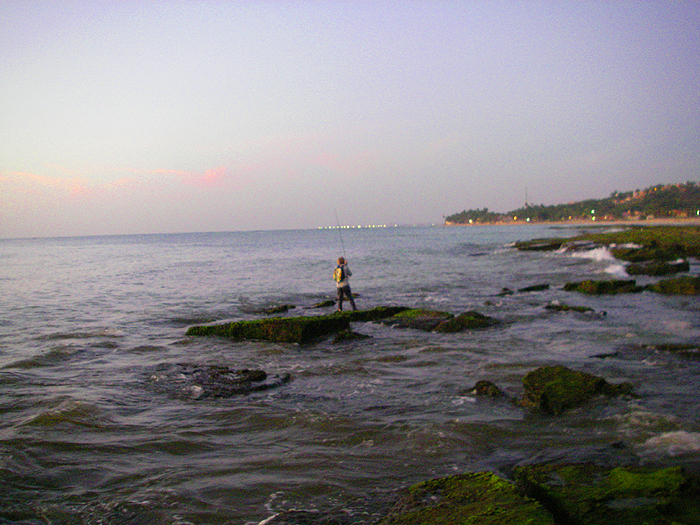 Rich explores the reef for 'snooky' spots. He's in! I notice and pick up the camera. Whoooaa! 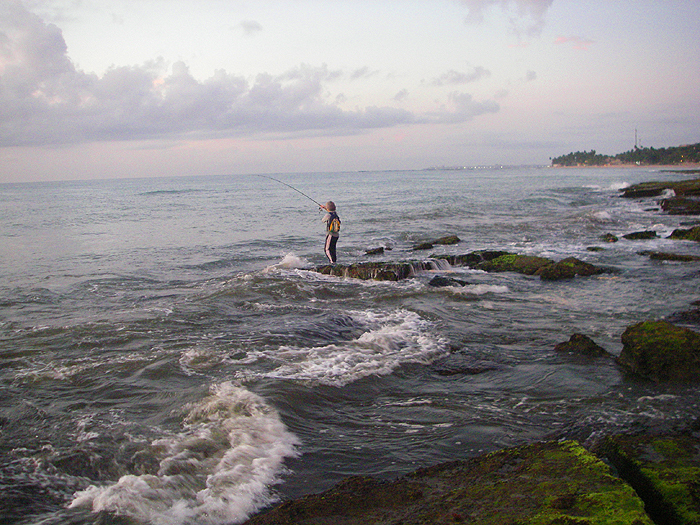 Richard's snook powers away along the reef face. Nearly there, notice the weed on the line - a constant hazard. Got it, Rich lifts his snook for me to see. Wading back and looking pleased with his fish. 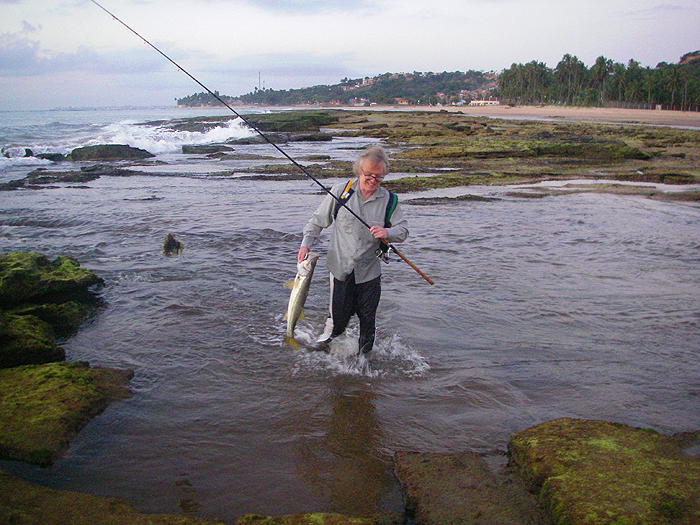 Another day and Richard's playing another good fish. Close in and the snook tries to plunge under a rock..
Sixteen pounds of beautiful fish - well deserved in difficult conditions. 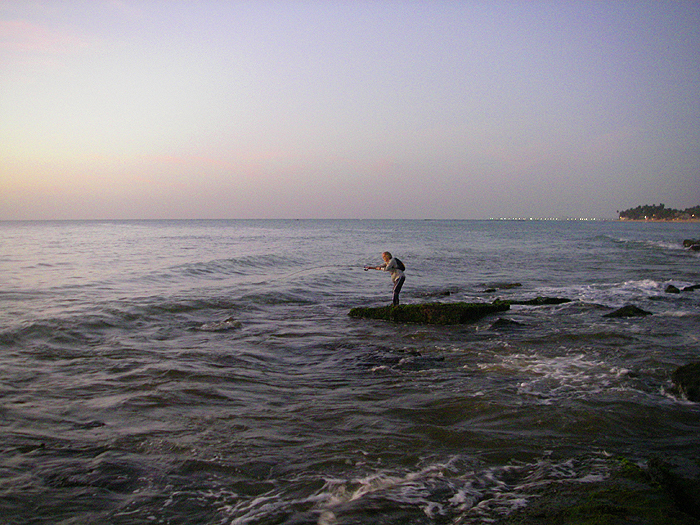 Rich had all his fish on Black Minnows - the lure bodies only survived one fish. My 28 pounder. Both of us lost a number of good snook which came unstuck. The Black Minnow wasn't our only successful lure. The biggest fish took a very large, unweighted, white Slug-Go.